I am so excited! When I got my first kindle 3 years ago Joleene Naylor's Shades of Gray was the first book I bought because it was about vampires and only $.99. I instantly knew I was going to like my PNR and UF dark and action packed. 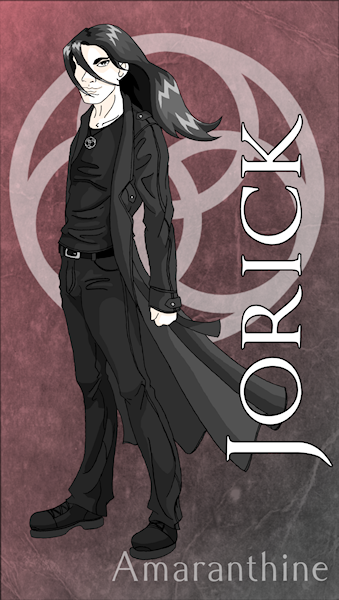 I also might have an unhealthy attachment to the series hero Jorick. Since then Joleene has published 4 more books in her Amaranthine series with book #5 coming out soon. I invited Jo to cook up a steaming hot serving of Jorick for you along with Verchiel, a relatively new additon to the Amaranthine series, much to Jorick's dismay. Compress bad temper until it appears to be “under control”, then mix all ingredients except the heart and let soak for five hundred years. Meanwhile, chip heart from the icy block of self-imposed isolation and allow to soften. Add to previous mixture and heat until it’s sizzling. Makes one steamy, dark vampire. Katelina and Jorick walked down the gravel road. On either side of them were fields of snow, occasionally broken by a handful of dark houses, and yards lit by orange security lights. Katelina’s toes were numb and she kept her hands burrowed in her coat. She was sure she’d have frostbite, on her nose at the very least, and she voiced the opinion more than once. Jorick’s patience soon ran thin, though he managed to keep his voice calm. Jorick gave a low sigh, then wordlessly scooped her up and unceremoniously slung her over his shoulder like a sack of potatoes. “Hey!” she cried. “What are you doing? I'm not baggage, you know!” She wriggled and kicked one leg uselessly. “Don't you dare! I don't like those stupid mind things you do and you know it!” She was as irritated as he was. This was the stupidest plan ever! To just stomp off in the middle of nowhere with no car, no food and freezing temperatures. There was absolutely no forethought put into it, that much was obvious. Mix all ingredients together and boil over an open flame. Allow to rise for a few hundred years in a dark, but noisy atmosphere. Shape and decorate with crayon-colored frosting to create one sinfully delicious dessert that is surprisingly low in calories. Serves as many as he can at once. As the minutes ticked by, the only sound was the rustle of the book pages and Katelina’s breathing. The tense silence was like a load of bricks on her chest. When someone knocked on the door, she fell all over herself to get it opened without thinking who might be behind it. After she saw who it was, she wished she’d thought first. 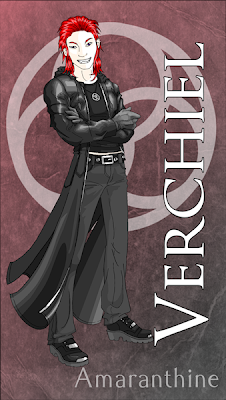 Oren’s fists clenched at the comparison, and Katelina had a sudden vision of Verchiel getting punched again. “Do you need something?” she asked quickly. “Go away,” Oren repeated with more venom in his voice. “Humans,” she snapped without thinking. “Oh, you’re right. Being surrounded by a bunch of bloodthirsty vampires sounds like a great time!” She crossed her arms over her chest, her eyes on the floor of the Atrium as it grew closer and closer. Two books in one: Shades of Gray and Legacy of Ghosts, the first two novels in the Amaranthine series weave a bloody tale of death, war, love and most of all vampires. 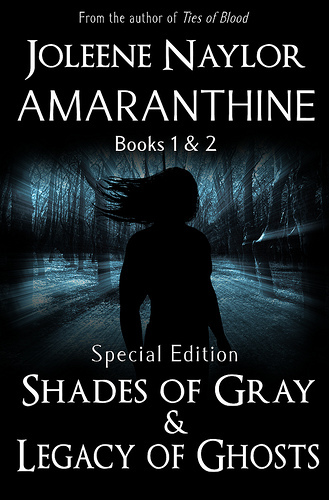 Shades of Gray (book #1): Hunted by a coven of vampires, Katelina has only one person she can trust: Jorick. But when her knight in shining armor turns out to be one of the monsters she has to examine her perceptions of good and evil to survive. Legacy of Ghosts (book #2): For Katelina and Jorick, peace is hard to come by. Kateesha plans to fight the same battle as Jorick’s fledgling, but a common enemy isn’t enough to overcome previous betrayals. Drawn into a deathly conflict, Jorick and Katelina must let go of old regrets, or lose their future to the ghosts of their past. *What’s a special edition without special features? Includes the “Lost Chapters” from Legacy of Ghosts, the short story “How to Silence a Human”, links to downloadable content and a character gallery featuring original artwork. 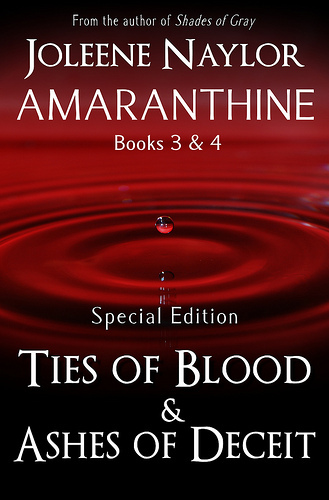 Two novels in one: Ties of Blood and Ashes of Deceit, the third and fourth books in the Amaranthine series, continue the saga of Katelina and her new world of blood, night and vampires. 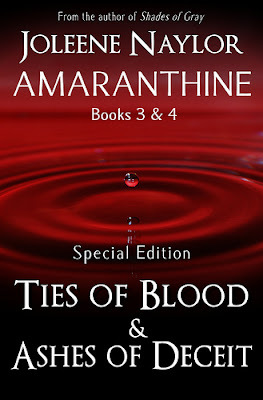 Ties of Blood (book #3): A trip to Katelina’s home starts a chain reaction; she and Jorick meet Verchiel, a too friendly vampire, then the police arrest Jorick for kidnapping. Worse, The Guild wants to question them. Will Malick, the head of the vampires, punish them? Or will the mysterious vampire following them do the job first? Ashes of Deceit (book #4): Katelina and Jorick must rescue a captured vampire and discover who really took him. The truth isn’t easy to find. As Oren’s attack on the Guild draws closer, Jorick and Katelina are led back to the Citadel. When the flames of war ignite, can they rise from the ashes, or will they be consumed? *What’s a special edition without special features? Includes character interviews, the story of Lilith, links to downloadable content and an Executioner gallery featuring bios and original artwork. Why should DVDs have all the fun? Jo is giving away a print copy of Volume 1 & 2 of the Special Editions to one person. That is all 4 of her stories! I love the recipes and taste tests. There probably is too dark but I have not read it as yet. I don't thank so. LOved the recipes very enjoyable. Great recipes! There is too dark; I have run into a few stories involving kids that I couldn't continue. Not sure if it can be too dark, at least I haven't come across one that has been. No. But sometimes the read has a limit and that's a personal choice. Not entering, but I did put this on my wishlist. That bit of mischief hooked me. Excellent! I loved this. And the ingredients sound perfect. Good luck to all who enter. To dark? Yeah, I think some can go overboard, but for the most part I love it. Checked out her website and got all the goodies I could find. Thanks for the opportunity to win books. Early congrats to the one that does win. don't think so. Thanks for the giveaway. The most attractive thing about your alpha male Jorick is that he has attitude. He is not a nice man, but he seems like a good man. In the long run, that is a necessary attribute of a leader. I have seen these reviewed before, I decided to give them a try. I figured I couldn't go wrong at that price. I am half way through Shades of Gray and am liking it. Thanks for another good recommendation. great! Yeah, I talk about this series all the time :) I like my vamp stories violent, action packed and dark. Something about Jorick pushes my buttons! Definitely let me know what you thought. Finished Legacy of Ghosts yesterday. It was slow going for me at first, but then it got better. Overall I enjoyed both books. Still need to finish up the bonus material. I think there's a point where if the author's not careful, the story gets unnecessarily dark. If bad stuff keeps happening pointlessly, then I think it's too dark and not a good read that I'll bother finishing. If the book is well done and written, then it never really can be too dark. Yes in some cases I do think so. That classic Snoopy opening line, "It was a dark and stormy night". Some of those dark nights in Urban Fantasies actually make me put the book down for a day or two till I can deal with it again. Yes sometimes they can get a little too dark if they involve torture, children, animals, or tortures of the previous listed. I follow the flock every way I can!! Vampire vs. Werewolf Hop & Giveaway! 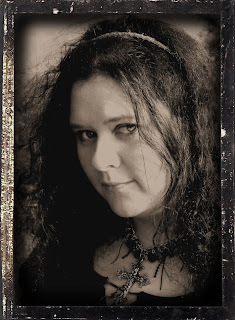 Sheep Interview: Donya Lynne ~ Giveaway!